Contact list is an important thing of your Android phone. Sometime you’ve to lost your entire contact list due to which you’ll be panic. But there is no need to worry this article helps you to easily recover lost contact list from Gmail on Android phone. Without contact list you’ll not be able to contact any other person. We have to memories only few important contacts of our family members, close friends or any official contact. But it is not possible to memories all the contact list in your mind. All family members, relatives, friends, colleagues and other important contacts are stored in your contact list. When you lost entire contact list from your Android phone you will be worried and want to know how to get back contact list again on your Android phone. During adding new Gmail account on your Android phone you have to set few simple settings. Gmail has the facility to store your all contacts during synchronized your Android phone. You must have to use this feature on your Android phone. Your Gmail accounts have complete information about any particular person. Gmail account not only store your contact list but also allows you to easily recover your entire contact list when you need. You have to take few simple given steps which helps you to easily recover lost contact list from Gmail on Android phone. Step 1: Open your Gmail account which you configured on your Android phone. 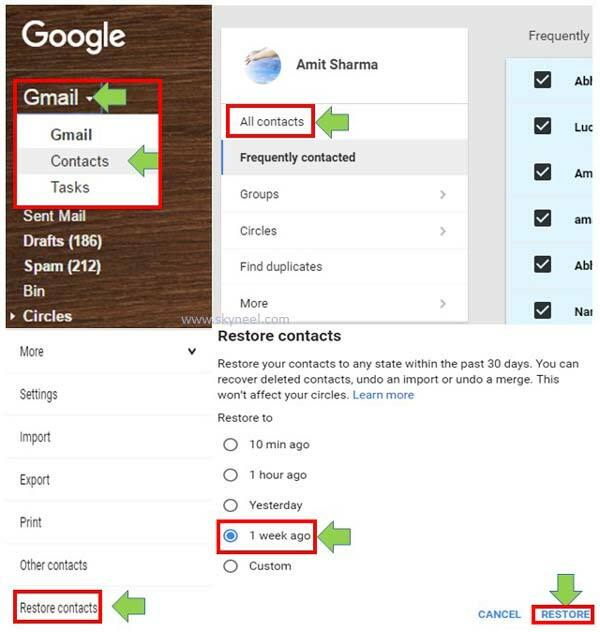 Step 2: Click on the drop down arrow of left side of Gmail and choose contacts option. Step 3: Select all contacts on your Gmail contact list. Step 4: Click on the More button. There are number of option available in the list, click on the “Restore Contacts” option. there are five options available in the “Restore contacts” box. You have to choose any required option to restore contacts. With the help of custom option you’ll be able to easily restore your lost contact list at any point within the past 30 days. Step 5: Finally click on the “Restore” button. After finish this process you must have to re-sync your Android phone. Step 2: Tap on the “Accounts” option which is placed in the “Personal” category. Step 3: Tap on the “Google” option, it will show active Gmail accounts which you already configured in your Android phone. Step 4: Tap on the three dot button which is placed on the top right corner. Now, tap on the “Sync now” option. Note: You can also turn on “Auto-sync data” option in Accounts window. I hope after reading this article you will be able to easily recover lost contact list from Gmail on Android phone. If you want to avoid this type of problem then you should take complete backup of your Android phone. It is the best way to immediately recover all lost contact list from Gmail on Android phone. If you have any suggestion regarding this article then write us in the comment box. Thanks to all.